Kids today know what a gym is. They know how to flex their biceps so their tattoos ripple just right, and how to stand on sunny dockyards and forcefully throw lengths or rope up and down, as if playing tug of war with themselves (Also see: Brothers). This, evidently, is what passes for ‘learning the ropes’ in Hindi cinema — it’s a shame these starlings don’t work as hard on, say, their dialogue delivery. There is, of course, a lot to be said in favour of the unschooled leading man. Subhash Ghai, who directed Hero back in 1983, never held the most brilliant scripts, but was certainly a canny filmmaker with enough foresight to train his spotlight on actors in whom he saw much promise. The reason for the enduring popularity of Hero remains, indeed, its leading pair: the affable and assured Meenakshi Sheshadri, and Jackie Shroff, a gangly goonda made to grab a flute and play kidnapper. Shroff, in particular, was like nothing we’d seen before, a reedy young fellow who looked convincing in a fight, wore a winning smile and could carry off a Tom Selleck moustache. His entire rough-around-the-edges persona was completely alien to the clean-scrubbed leading men of the time. Sooraj Pancholi, on the other hand, is Gold’s Gym come to life. Where Shroff had broken the mould, young Pancholi is all-mould: all muscles and stubble and eyes struggling to appear moody. The kind of ‘look’ every Lokhandwala struggler wants, and many have. He walks around this film with an insufferable layer of smugness — even in the fight scene announcing his entry, he makes his way into the frame looking not at the villain but with his head cocked down, just so he can look up dramatically to make eye-contact with the camera. Tsk. He isn’t entirely awful when silent, but struggles in particular when saying anything more than four-words long, his modulation rife with awkward pauses as if waiting for the teleprompter to refresh. Nikhil Advani’s Hero remake follows the template of the original, which may not have been the wisest course of action. Sooraj plays a local tough (called Sooraj) who beats up on people and is the Robin of the Hood, giving away scholarships to boys in need. One day he is called upon by Pasha — father Aditya Pancholi, who, in a Mukherjea-an twist, plays his uncle — to do him a favour and kidnap the daughter of a tough cop sniffing out his trail. Sooraj does so unquestioningly, and the “bathroom-selfie” clicking daughter Radha (Athiya Shetty) is thus whisked away into the woods, too distracted by his abs to notice she’s been kidnapped. Meanwhile, her dad Shrikant Mathur (an eternally-exhausted Tigmanshu Dhulia) fumes and tries to get his daughter back. 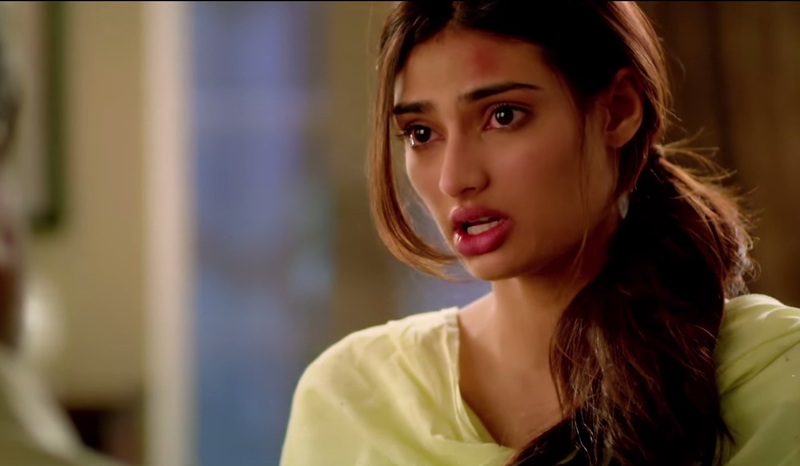 Perhaps there is a clue to be had in Mathur’s first reaction to his daughter’s kidnapping: he goes home with slumped shoulder and looks at a crayon-drawing headlined ‘My Daddy Strongest.’ Maybe we are all just misled by Athiya Shetty’s impressive height and pout but Radha happens to just be a really tall seven-year-old. This would indeed explain a whole lot, even as we watch the film’s first half roll out like Highway For Dummies. Sunil Shetty’s daughter Athiya plays her part with the infuriatingly wide-eyed naïveté of an early 90s heroine, plus a voice as screechily high-pitched as a dog whistle: Maybe we should just call her Bhagyashrill. It isn’t entirely her fault, of course. This is a poorly-written film where the kids don’t seem to have any true allegiance to the parental figures or any consistent morality or conflict, even. This is a film where the girl prays to a statue and calls it “Buddha Ji”, and a film where a grown man is upset at a youngster (a youngster who kidnapped a girl to save him) just because he didn’t choose to hold the old man’s hand. This is a film where the villain is a young man who looks like he’s walked out of a Manyavar commercial and even he has more presence than the insipid leads. This is a film where a man and a woman hold hands and talk about the importance of a kiss on the lips and then kiss, instead, on the cheek. This is a film where Dhulia — a talented director and one of the best dialogue-writers we have — looks drained out playing the girl’s father, and appears warily to accuse Advani when he wonders out loud how much he must be insulted, how much he must be put through. hahahaha….. “the villain is a young man who looks like he’s walked out of a Manyavar commercial”…. brilliant review! Your review is more entertaining and have far better writing than HERO.